The purpose of my stay here has been to apply the skills and knowledge I’ve learned in school in a professional environment, as well as to witness the inner workings of a major conservation lab. My time has been divided between bench-work, tours of local collections and labs, and meetings with co-workers on environmental monitoring and task division. My bench-work has been largely comprised of picking up on long-term projects begun by previous interns. Hence, my treatments have required looking back through old treatment reports and doing my best to apply likeminded methods to the books I’m handling. This has really emphasized to me the importance of documentation, which allows future handlers of objects to know what exactly has been done to them in the past: what has been replaced; what methods and materials were used; what, exactly, has changed about the object. It was vital for me to make my treatments match previous ones. 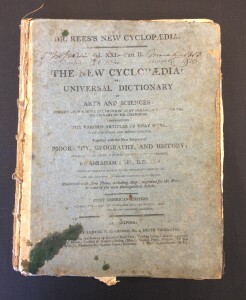 I spent a great deal of time working on a volume of the first American edition of Dr. Rees’s New Cyclopaedia. (This was the first item handed to me upon my arrival, which took me by surprise, as I am in the middle of working on a volume of the English edition of the Cyclopaedia at my bench in England!) 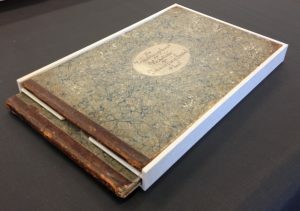 The book—which is uncut, untrimmed, and still in its “temporary” publisher’s binding—is a nice book-history artifact, and my goal was to make it stable and accessible while changing as little about it as possible. The conservation lab has been working with most of the volumes in this 47-volume set, but this one was in considerably bad condition. 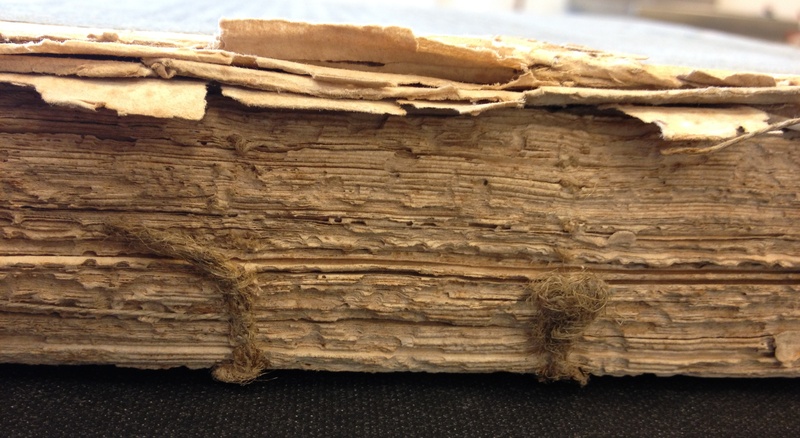 Its entire spine had suffered from an insect feast, with 90% losses to its original spine cover and spine folds, leaving only bits of its support cords and sewing intact. 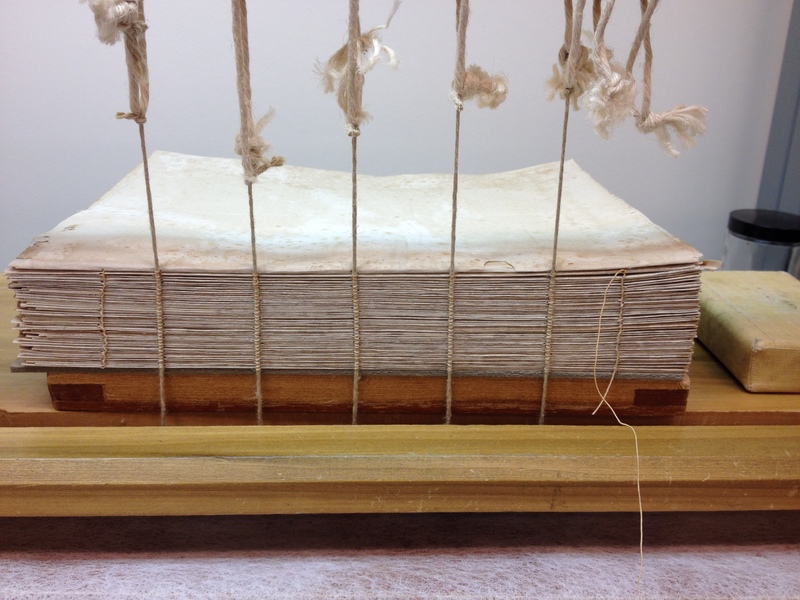 The loss of its sewing structure did allow me to completely dis-bind and wash the text-block, which was considerably soiled. Each section was given two gentle 20-minute baths: first in deionized water to wash away dirt, then in water with calcium carbonate (chalk) to provide an alkaline buffer against acidity. The sections were dried under weights to avoid cockling. Each section was then given a Kizukishi Japanese tissue guard along its spine fold. 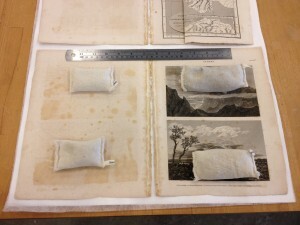 This tissue was strong enough to hold the book’s new sewing, but not thick enough to add too much spine swell. At the back of the volume, nine etched plates were tipped onto the final leaf—an unstable construction that had inevitably caused issues. 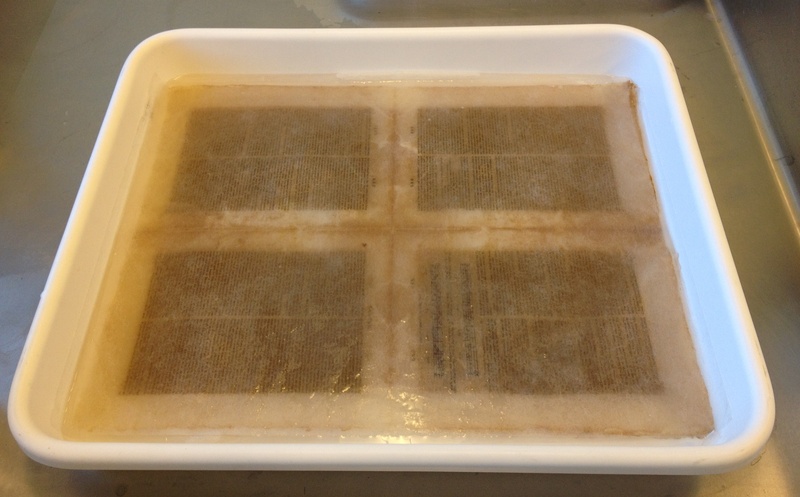 By washing these etchings (after a quick spot test to ensure the stability of the inks), I was also able to separate them, as the water-soluble animal glue holding them together quickly dissipated. 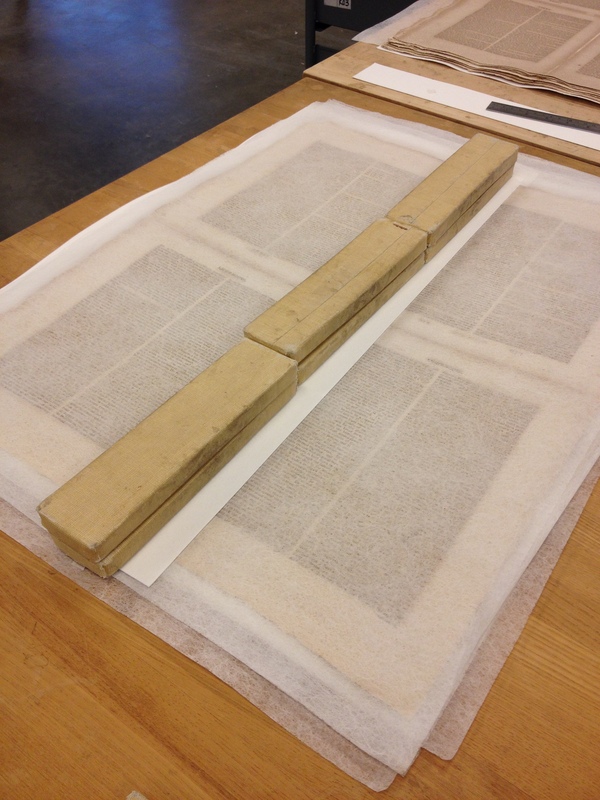 The plates were then created into folded sections with Japanese tissue hinges so they could be sewn into the text-block. 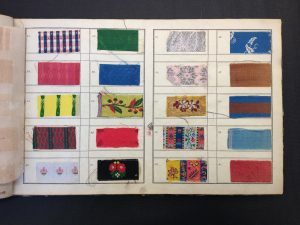 The sewing was done over five thin linen cords, and was sewn two-up—a sewing pattern in which two sections are sewn at a time, with the thread moving between sections at each station. 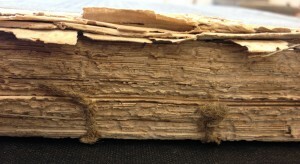 In a book like this that has a large number of thin sections, two-up sewing avoids creating too much swell in the spine. 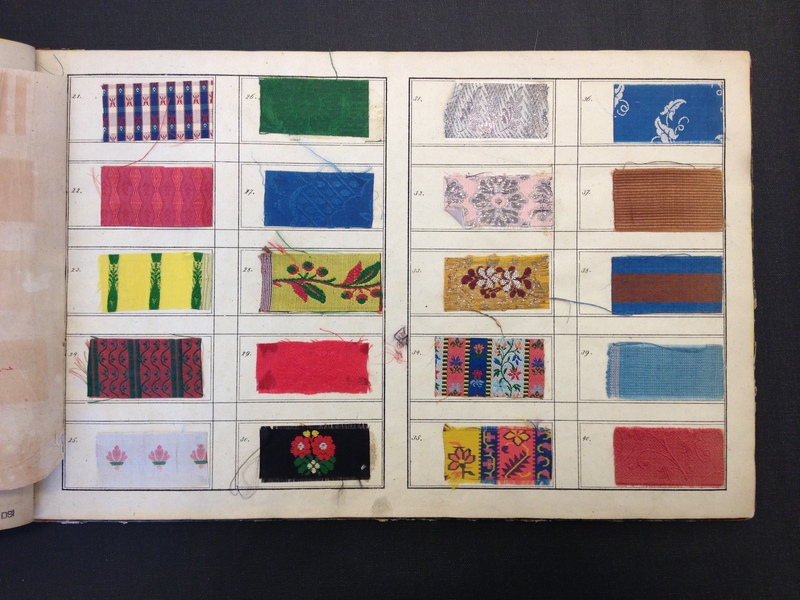 The thread passes through once every two sections, which cuts the amount of thread used in half. 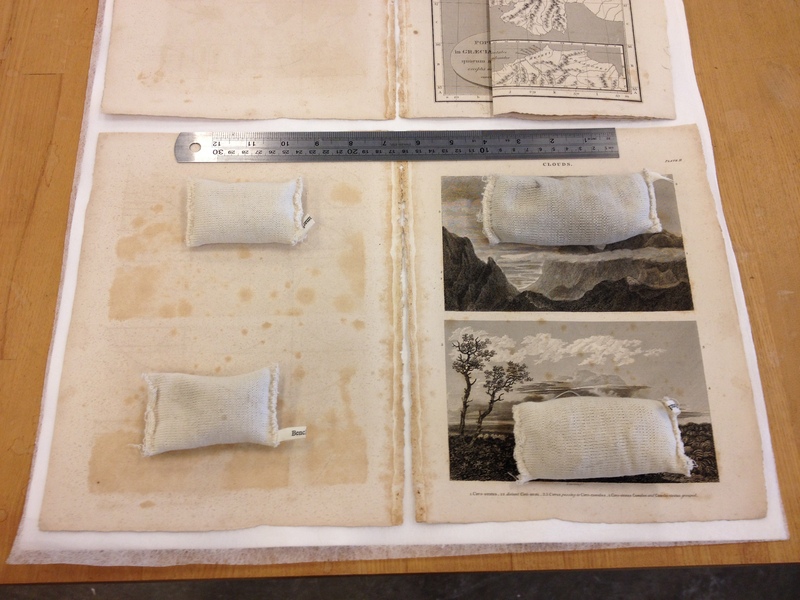 The cords were then frayed and inserted between the pastedowns and boards with wheat starch paste. The entire spine was covered with an acrylic-toned Okawara Japanese tissue that overlapped onto the boards, consolidating the text-block and reinforcing the board attachments. This lightweight, simple structure is comparable to the original, which can be seen on the other, better-conditioned volumes in the collection. I also worked on several housing projects. The Smithsonian has seven volumes of Minotaure, a surrealist magazine from the 1930s funded and advised by arts patron Edward James (the founder of my school, West Dean College). 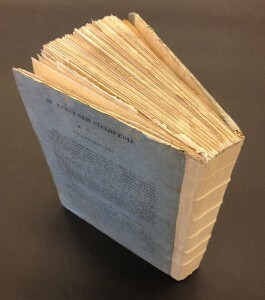 The volumes are quite delicate and rare, so a protective housing was necessary. 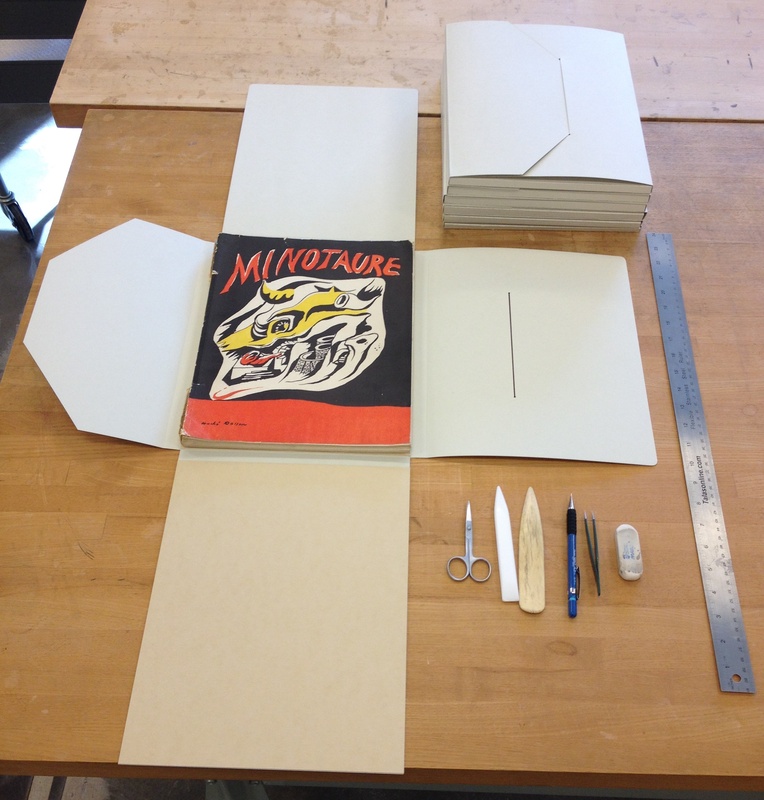 Each volume was first placed in a custom four-flap container, made of cardstock and stiffened with a heavier card. And now it’s time for me to head back to England to finish up my schooling. A big thank-you to Vanessa, Katie, Don and Michael in the conservation lab for being so welcoming!